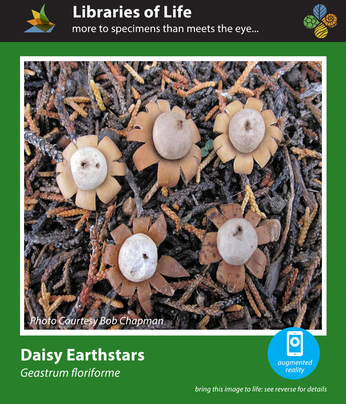 THE DAISY EARTHSTAR: DID YOU KNOW? Red regions show the distribution of Daisy Earthstars The base map is a satellite image. Credit/source: Base map courtesy of NOAA. 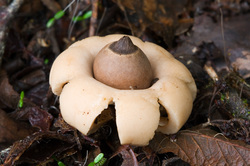 Digitized Geastrum specimens in biological collections. An important feature of Daisy Earthstars is their ability to be hygroscopic; they respond to changing humidity by closing and expanding the rays that surround the spore sac, thereby regulating water loss. Daisy Earthstars have traditionally held various medicinal purposes. Native Americans used the powdery inner mass of mature puffballs to stop bleeding. The billions of dry spores inside a puffball are relatively aseptic and thus were ideal for dressing wounds. Mushrooms and related fungi (macrofungi) play a critical role in the lives of plants and animals, including humans, yet their diversity is often underestimated. Understanding this diversity will be critical in analyzing impacts of habitat change, distributions, and diversity of host organisms. 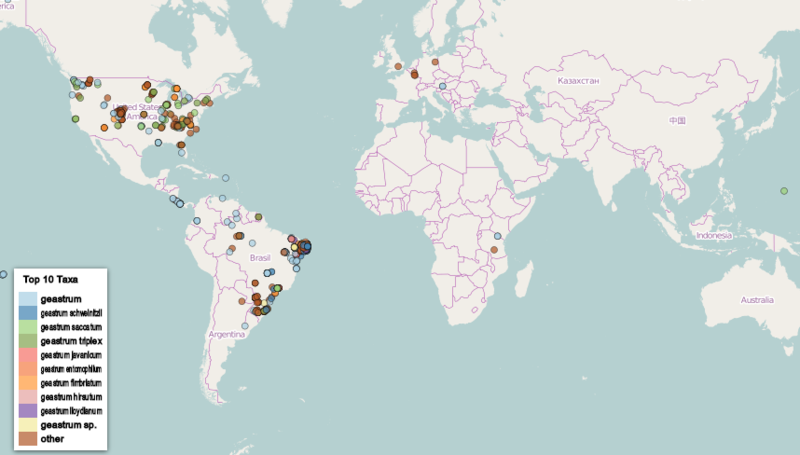 Over the past 150 years, 1.4 million dried fungal specimens have been conserved in 35 institutions across 24 states with digitization efforts underway to make these collections and related data accessible online.